1. After the first season or two the covers are apt to stretch and so result in imperfect sealing, thus admitting air laden with germs. 2. The covers furnish an excellent hiding place for germs, and collect dirt behind the porcelain portion inside. 3. It is not desirable that foods should come in contact with metal of any kind. So it is clear that, although these jars may be cheap in price, they are the most expensive in the long run. However, should it be necessary to use the screw-top jars, they are best suited for fruits containing a large amount of sugar (a pound of sugar to a pound of fruit), such as preserves and jams, which are not favourable to the growth of bacteria and yeasts. Fig. 1. - Ordinary screw-top jar. 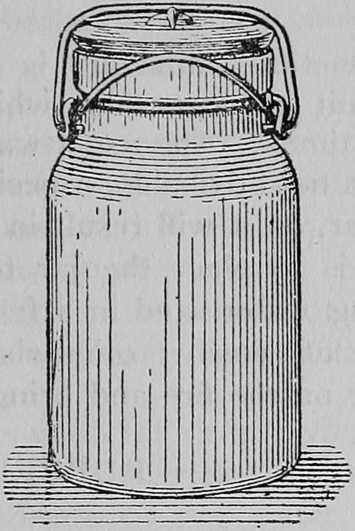 A better class of jar is that which has a little loose glass or porcelain top held in place by a metal screw, such as the "Hazel or Wuidart's Perfect." (See Fig. 2.) If the canning or sterilisation is properly done, practically all of the air will be driven out of the jar by the steam. Upon cooling, this is condensed, a vacuum is formed inside, and the pressure of the outside air forces the lid down tightly and seals the jar automatically. The metal cover can then be removed, as the glass top will be held securely in place. Fig. 2. - Improved screw-top jar. Fig. 3. - Spring-top jar. 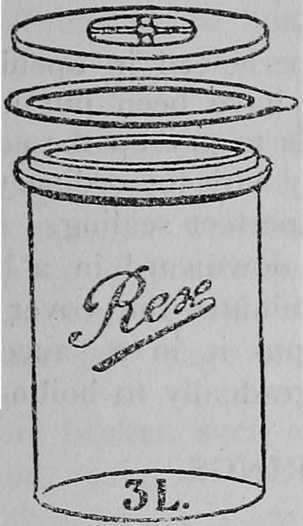 The most perfect of all jars, however, are those which close by automatic suction, such as the "Rex" and "Week's" jars. These jars are somewhat expensive in price, but the glass, as well as the rubber, is of such a superior quality that it well repays one for the outlay, and with careful handling should last for many years. 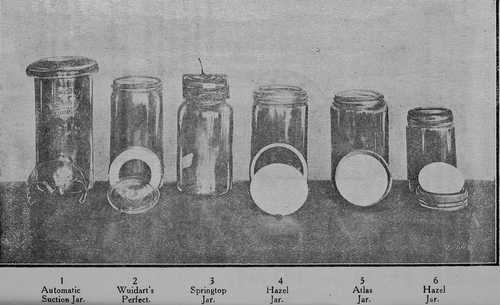 Popular types of glass jars. In selecting a jar, preference should be given to those having wide mouths, especially if whole fruits or vegetables are to be canned, while they are also much easier to clean. 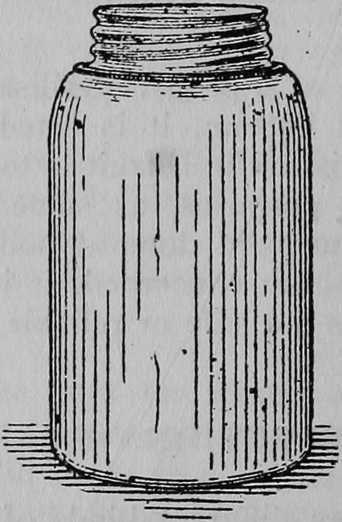 To test the ordinary screw-top jars, such as the "Atlas" and "Mason," put a little water in each, adjust the rubber, screw down the top, and invert. If the jar is not air-tight, it is better to discover the fact before it is filled with fruit. If the jar does not leak, be careful to keep it with its own cover, as every perfect cover does not always fit every perfect jar. Should the jar be found to leak, try an additional rubber. Sometimes difficulty is experienced in opening jars of fruit or vegetables which have been put up for a long time. 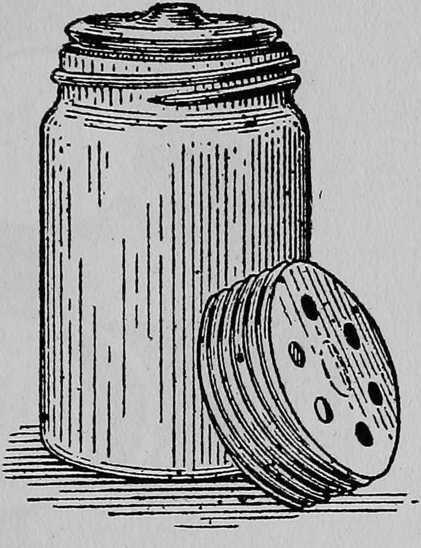 The usual way is to pry up the edge, but this is not advisable, especially with the ordinary screw-top jar, as it will result in imperfect sealing. A better plan is to place the jar top downward in a basin of boiling water, and in a few minutes the cover should come off easily; otherwise put it in a saucepan of water on the fire and bring gradually to boiling point. The use of fresh rubber rings every season is an important point in canning and preserving. It is poor economy to use them a second time, unless the rubber is of a very superior quality, for it will be found that the ordinary rubber rings crack very readily, and thus result in imperfect sealing. Black rubbers are more durable than white, and sometimes it is possible to use rubbers a second time by dipping them in hot melted paraffine wax, although for canned fruits and vegetables it is advisable always to use fresh ones.